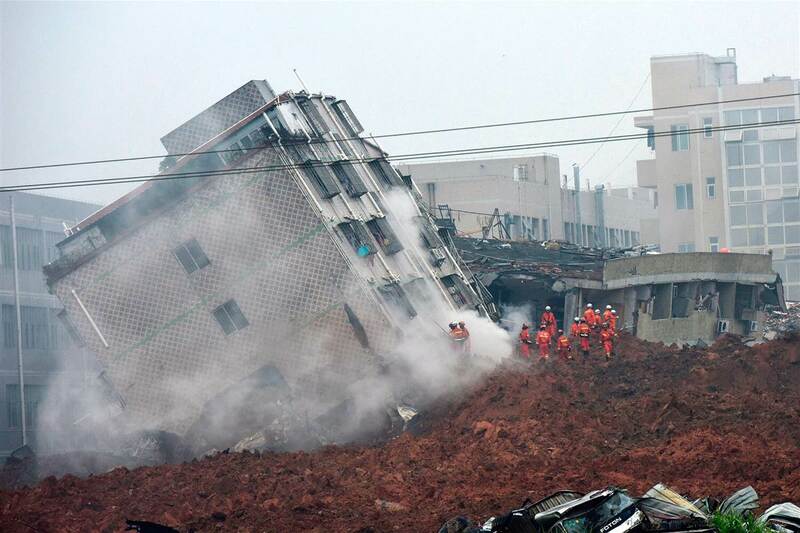 Chinese rescue teams are looking for survivors after a landslide hit 33 buildings in the southern city of Shenzhen. Seven people were pulled from the rubble with minor injuries but 91 are still missing. About 900 were evacuated as the landslide struck on December 20. Local authorities said a huge man-made mound of earth and construction debris lost stability and collapsed. Shenzhen is one of China’s biggest and is a major industrial center. The city is situated in the southern province of Guangdong, across the mainland border from Hong Kong. The landslide has blanketed a vast area of 380,000 sq m covering it with up to 10m of mud at an industrial park, Shenzhen’s emergency management office said on its official microblog. State news agency Xinhua said that the landslide caused an explosion at a natural gas pipeline. Workers have cleaned up about 400m of damaged pipeline and are now repairing it. China’s land and resources ministry said in a statement on its website that initial investigations showed the landslide happened when a huge mound of soil, cement chunks and other construction waste became unstable. “Because the mound was very large, and the angle of its slope was overly steep, this led to it losing stability and collapsing,” it said. According to People’s Daily, the mound had accumulated at a stone quarry that had been converted into a dumping area with its entrance and exit facing an industrial district. Residents evacuated from the surrounding area described hearing loud roars when the landslide happened. Amateur footage of the incident broadcast on state television showed waves of red soil quickly engulfing and crushing buildings. A video taken by an eyewitness and posted online by Beijing Daily newspaper shows plumes of soil shooting up in the air as the mound of earth collapses.